It’s Already Been Tested Successfully - Rotarians in Guatemala have installed a digital x-ray system (designed by the World Health Organization (WHO)) in the Guatemala City Municipal Clinic to serve children at risk and municipal employees. Technicians send the images to nonresident radiologists via the Internet for interpretation. 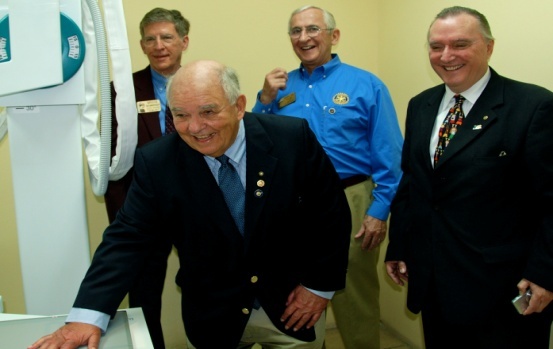 U.S. Rotarians, the city government and a private technical group installed the first unit. How It Worked - Rotarians raised the funds, engaged a manufacturer and the technical organization that installed the system. The Municipality invested in the restoration of the clinic to a level appropriate for the demands of the system and the patients. The Guatemala Project Proposal - Install 29 additional x-ray systems in Health Centers nationwide. Who will collaborate? This project has been designated ‘top priority’ by the President and First Lady of Guatemala. The Long-Term Objective - To provide much-needed diagnostic imaging equipment to marginalized populations in the developing countries where Rotary Clubs are rendering “Service Above Self.” The WHO says that two-thirds of the world’s population lacks access to efficient diagnostic imaging health services. There is little or no government funding for such services in developing countries and radiologists and technicians often will not work in remote or low-income population areas. With the digital X-ray system designed by the WHO, non-resident radiologists can acquire the images via the Internet and interpret them. Many prior installations have failed to deliver results because there was no involvement of all the stakeholders. By engaging government and non-profit organizations in a partnership such as the one in the Municipality of Guatemala, the project partners are confident of very positive results. The Funding Proposal – In addition to outside funding from governments or foundations, Rotary clubs are asked to contribute $1,000 if under 40 members and $2,000 if over 40 members (think of this as a long-term “ShelterBox” investment). For more information - X-ray technology documents related to this project are at www.imagediagnostics.org. To learn how to become involved with this project, contact PDG Pamela Kerr, Project Chair, at gov.pam@rotary6440.org.